The Archer Viola is hand-crafted from select spruce top with a flamed maple back. Varnish is reddish-brown and is hand applied. It is available in sizes from 12” through 16”and includes an outfit. The outfit includes a hard viola case with latch and cordura covering and a carbon composite bow. Professionally set up it is ready to play. 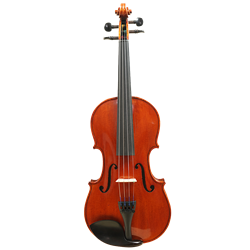 It is an excellent student instrument that promotes correct learning with a pleasing tone and feel.